A qualified individual that in good faith and exercising reasonable care makes a disclosure of information pursuant to Section 3 shall be immune from administrative or civil liability that might otherwise arise from such disclosure or for any failure to notify the customer of the disclosure. Section 4 grants immunity from potential administrative or civil liability to a qualified individual for making a report pursuant to Section 3. The individual must have acted in “good faith” and exercised “reasonable care” in making the Section 3 report. These are intended to be objective, not subjective, standards. But Section 4 grants no immunity from any potential criminal liability. [i] Section 4 furthermore confers no civil or administrative immunity with respect to prior misconduct by the reporting individual – i.e., an individual cannot engage in wrongful conduct, report that wrongful conduct pursuant to Section 3, and then seek civil or administrative immunity for the prior wrongful conduct under Section 4. 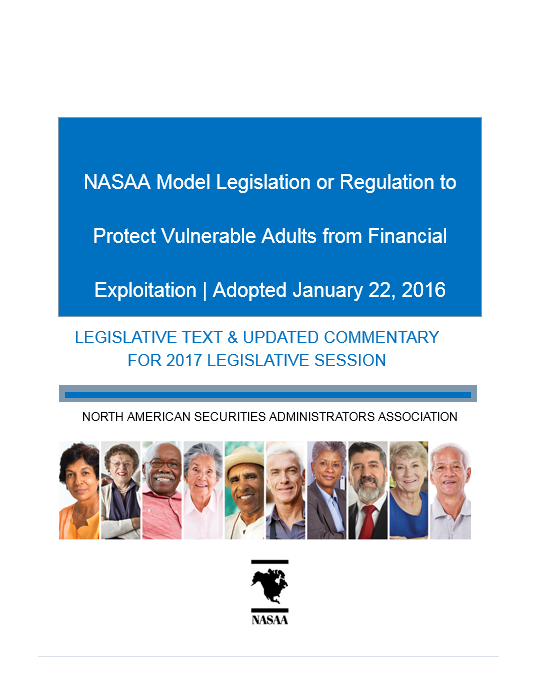 [i] The provision of criminal immunity was considered and rejected by the NASAA Committee prior to seeking public comment on the Model Act, and no commenters presented persuasive arguments for its addition. Indeed, neither the NASAA Committee nor commenters were able to envision a situation in which criminal liability would arise from either the reporting requirements of the Model Act or from the delay of a disbursement pursuant to Section 7. Some commenters sought further clarifications as to the applicability of the immunity provisions in Section 4 to specific actions brought by specific parties. Some commenters wanted clarification that the immunity provisions extended to actions brought by government entities, such as state securities regulators or APS agencies. Other commenters advocated for the inclusion of immunity from criminal liability. Still another commenter sought clarification as to the “good faith and reasonable care” standard, the extension of immunity beyond reporting and disbursement delays, and clarification that nothing in the Model Act would limit a firm’s options under existing law, such as the ability to utilize certain contractual provisions. However, the NASAA Committee concluded that the language in Section 4 fully encompassed the scope of all civil and administrative actions, and no further clarification was necessary.